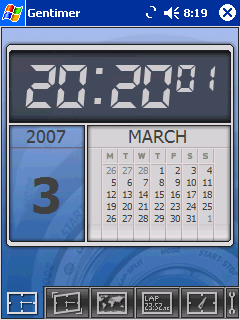 Gentimer is best selling clock application for Smartphones, and we're currenlty workin on Pocket PC version. That's why we are looking for beta testers that would help to make this product better. The first 25 persons that will proivide feedback from the beta test will receive a free copy of this program. If you're interested, please keep on reading. The application is called Gentimer and it is the application that every Gentlemen or Gentlewoman should have on their smartphone. * Sleepy - for all of you, that have problems getting up in the morning; to stop it, you need to type a code. * Gentle - 5 minutes before the alarm, a gentle sound is played to wake you up a little bit, so you will wake up gently. - Supports WAV, WMA, MP3 (WMA and MP3 only if Windows Media Player 10 is installed) sounds. 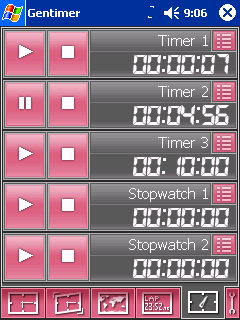 Stopwatch:- A stopwatch with multiple laps support. The program should run on any WM 2003/ 2003 SE/ 5.0 Pocket PC with 240x320 and 320x240 resolution, but we need you to confirm that. We plan to add other resolutions (240x240, 640x480, etc.) shortly. We will appreciate any feedback about bugs you find, features you miss, or anything you like/dislike about the program. So if you have any comments about Gentimer please write to the support [at] rivia.net or here in this topic, and remember to give us your name, device model, OS version. I've attached some screenshots to give more light on the product. Its not my real name ya know !!! Looking like a slick application. I'll let ya know how I get tomorrow night. Gonna see if it can wake me up in the morning, Im like the living dead when my head hits the pillow. A Today plugin that shows the next active alarm would be nice. Clicking on it loads gentimer application. Exit the application button/menu would be nice? When configuring alarms I click on the alarm until the options menu appears, however a lot of the time I end up disabling my alarm (single click). Could enable/disable by presented by a tick box next to each alarm? When configuring an alarm allow a preview alarm tone option for the seleted alarm tone. 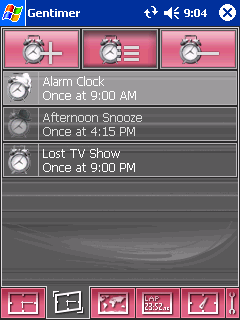 When configuring the alarms show the current time somewhere on this screen. Should snooze stop working if the application is exited? Great app though. I always used to use it on my SPV600 and its good to see it on PocketPC.. I remeber trying out the smartphone version sometime ago. Was pretty impressed then so will see how this version is now i'm on PPC. All good so far Mateusz, Glad to see the alarm sounds even if you've forgotten to enable the system volume as i have done before ;) Just one comment - I used the .EXE instead of the .CAB file and it took a good few minutes to install. (This may be down to the phone though I guess) Using SPV3100 and WM5/original Orange ROM. Thanks for letting us try you app. I am using a HTC 8125 running wm 5.0 this morning the alarm sounded on time, but I had loaded a full song to play in mp3 format and it played the first 30to 45 seconds of it then it shut off, when I rolled over to look at the phone I noticed it had a popup stating cannot start \storage card\gentimer\wakeupapp.exe. not sure when it happened but I assumed when the alarm cut off the song and try to restart. so I set the alarm forward and tried again this time it sounded 30-45 seconds in it cut off the song again but didn't give me the popup, then 10-15 seconds later the song started again, etc., etc. Is it possible to get it to play the whole song? One more thing, I have noticed that it takes up to 6 seconds to load and run with no other apps running. this may be normal ut just thought i'd mention it. About the mp3 - it is designed to work that way, so you won't get used to the song in the background ;). But maybe I should extend the time of play to 2 minutes, I will think about it. About the long load time, I'll try to speed things up in the next release. About the mp3 - it is designed to work that way, so you won't get used to the song in the background ;) . But maybe I should extend the time of play to 2 minutes, I will think about it. I am using imate jasjar. The snooze function doesn't seem to work on me. I have tried for at least three alarms and set it to 10 minutes. After the alarm goes, I press snooze, then the alarm is already disabled and will not alarm anymore after 10 minutes. I too seem to have developed a problem with Snooze now. Basically when an alarm sounds, I hit snooze (default snooze time set) but the alarm never sounds again. The app is still running. I have tried re-installing incase anything else has caused an issue with this application but still not working correctly. 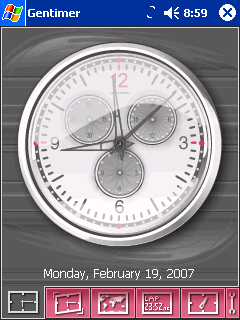 Yes, this is a bug, but I've already fixed it, and with a bit of luck I will release new Beta version with the new skin with digital clock today. Great stuff, will you post here to let us know it is available? Ok, the new version is ready. We've fixed some graphics issues, and mainly the device wakeup issues (belive me porting such application from smartphone to Pocket PC isn't easy :D ). And in this version there is a new skin which you can choose via the Options dialog (the small wrench on the bottom-right corner of the screen). Of course there are still some bugs unclosed, but this version is pretty stable, so if you find any bug, you know where to write. And here are the screenshots of new skin, I hope you like them as much as I do ;). I have downloaded the CAB and successfully installed. However, the app would not open. I am using jasjar. Ok, I installed the updated Gentimer yesterday evening over the old one and ran the app. Looked nice, as usual, then closed it down and cleared it from ram, or so I thought, now when the phone is supposed to shut off the screen to save power it stays on and then when it is supposed to shut down to save power it comes up a white screen and stays white, the screen is unresponsive to touch but buttons wake it up and screen comes back, to get it back to normal I have to soft reset. Also, this morning I woke up to a message something like "Could not start wakeupapp.exe", the ringer didn't sound at all. thank god for backups ;) Me thinks this could be your first bug. App looks great though except for one thing, there is no option for changing it from military time to normal. By the way, to refresh I'm running WM6 PDAViet 3 on a HTC Wizard 8125 and the program is still stored on the SD card. Thank you for the info, good to know that there are problems with WM6, but you know, this version of Gentimer will not be marked as compatible with WM6 (I don't even have SDK installed yet :D ). Another thing is that you're using some unoffitial ROM image, hence there may be problems with that. I will invastigate them after the release of WM5 version. Are you getting any errors when starting the application? Or does it just never comes up? What about task manager? Can you see Gentimer there? The wait icon appears then it stays like that. i'll try again and see if it is shown in the task manager. Thank you for the info, good to know that there are problems with WM6, but you know, this version of Gentimer will not be marked as compatible with WM6 (I don't even have SDK installed yet ;) ). Another thing is that you're using some unoffitial ROM image, hence there may be problems with that. I was running the last version of Gentimer on WM6 and it worked fine, but just to make sure I am going to reinstall the last version and see how it works fir the next 2 days and I will post again whether or not I have the same problems. - the ability to snooze the alarm by Taping and Holding the sreen. I've tried to remove all the functional bugs in this version (and I hope I succeeded in that), so if you find anything that works strange or doesn't work at all please let me know. 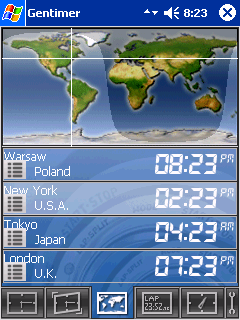 I know that still there are some UI bugs (like the edit city buttons in World Time view), but I'm just waiting for graphics, and they will be fixed. So if everything goes well, we should be able to release Gentimer for lo resolution devices (240x320, 320x240 and 240x240) tommorow. I will notify each one of you how to get the registration code for the release version. Hmm, I think I know what may have caused this issues, and I fixed it in the new release, so please install it, and try if it works. 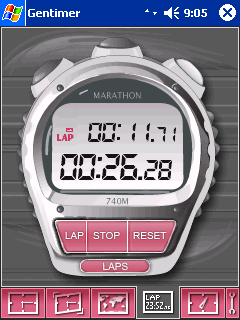 Ok I reinstalled the last version of gentimer and have used it the last 2 mornings and it worked fine as it did before. Now I have just installed the new version and at first walkthru looks the same, great job as usual, the bugs I metioned before are now gone. 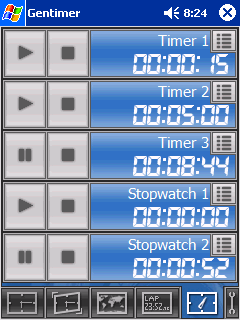 Is there any way to add a selector for 12 hour format for the time? Thank you very much for your help in making this product as it is, without you it we would have much more work. In order to receive the registration code I've promised, send an e-mail to support [at] rivia.net and send your device's owner name and I'll send back the code. Still, if you find any issues, or anything - you know where to find me :D.